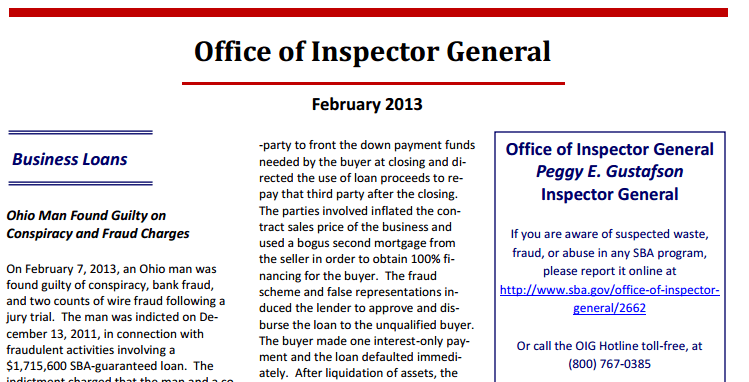 SBA OIG nabbed two fraudsters in their February report. The first was found guilty of bank fraud in connection with a $1.7 million SBA 7(a) loan. He provided false and fictitious loan application documents, invoices, and additional supporting documents to a bank and the SBA in order to secure the SBA-guaranteed loan for his recycling company. The proceeds of the loan were to be used to open and oper-ate a tire recycling plant in Troy, Ohio. The second, a loan broker, was charged with two counts of bank fraud in a $1.8 million SBA loan that resulted in a $1.2 million loss. The OIG says the loan agent recruited an unqualified buyer for the gas station and prepared counterfeit investment account statements, cashier’s checks, and a bogus management résumé to make the buyer appear qualified to the lender and the SBA. The loan agent also recruited a third-party to front the down payment funds needed by the buyer at closing and directed the use of loan proceeds to repay that third party after the closing. The parties involved inflated the contract sales price of the business and used a bogus second mortgage from the seller in order to obtain 100% financing for the buyer. The buyer made one interest-only payment and the loan defaulted immediately.